The Museum of Modern Art’s public-relations rollout of its latest (can we never say “final”?) expansion seems to have been about as convincing to the invited scribe tribe as was Gov. Chris Christie‘s “I-am-not-a-bully” press conference yesterday regarding BridgeGate in Fort Lee. Leading the procession of mourners for the soon-to-be demolished Tod Williams Billie Tsien-designed headquarters for the now relocated, downsized but resurgent American Folk Art Museum (AFAM) was distinguished architecture critic Paul Goldberger, with whom I engaged in a Twitter debate last spring (excerpted here) over this situation. The brooding, somber façade of the folk-art museum, made of folded planes of hammered bronze, combines monumental dignity with the image of delicate handcrafting, and it is a majestic, if physically small, architectural achievement. A city that allows such a work to disappear after barely a dozen years is a city with a flawed architectural heart. A large cultural institution that cannot find a suitable use for such a building is an institution with a flawed architectural imagination. 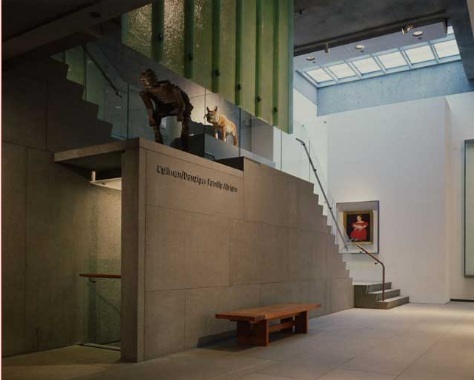 Despite the many rave reviews the 30,000-square-foot building received when it opened in December 2001, it was immediately clear to many that the building was not only ugly and confining, it was also all but useless for showing art—especially art as visionary as this museum’s…. The architects responsible for this utter lack of imagination and hubristic mess of starchitectural vanity, Tod Williams and Billie Tsien, were praised for their intelligent use of materials. While I believe in preserving important buildings, I don’t believe in architecture-for-architecture’s sake. You need both form and function. The AFAM knockdown is a building that does have a certain sculptural interest (especially for its generally admired, although unwelcoming, façade) but from the day it opened in 2001, its off-putting interior never worked well for its intended purpose. While its demolition is saddening, it is not (in my view) the architectural crime that some critics would make it out to be. Maybe so. But it hasn’t well served the purpose for which it was intended. For a building, unlike a work of art, it’s not enough to be an object of aesthetic appeal and scholarship. It has to work. 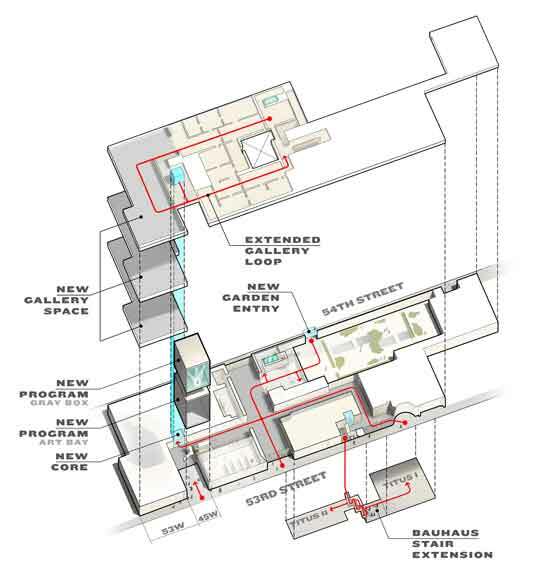 The most interesting question, to me, is whether the ever-expanding MoMA, which keeps destroying major chunks of its own previous expensive expansions designed by renowned architects, will get it right this time. I was not privileged with an invitation to this week’s press rollout, so my considered judgment on the MegaMegaMoMA will have to await my receipt of additional information that I have requested from the museum. Yesterday I did venture a few prelimary impressions, based upon the brief press releases and four preliminary concept drawings that I belatedly received.